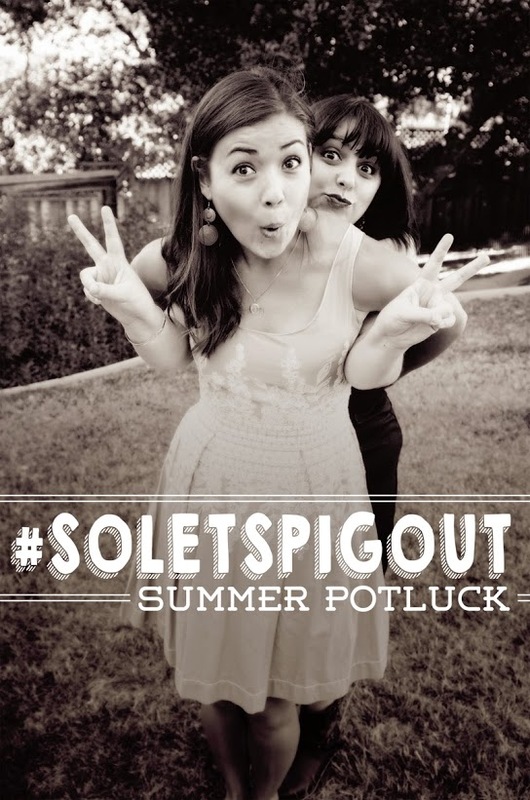 It’s day four of the #SoLetsPigOut Potluck and we’re dishin’ up dessert like it’s our job. Oh wait… it kind of is our job. We have pretty cool jobs. Perhaps you’ve been following along this week (yay-welcome back!). For those of you who are just now joining us, let me catch you up. This week I teamed up with my friend Emily of The Pig & Quill to celebrate summer with a virtual potluck. We’ve brought you original co-created recipes all week, along with tons of fun giveaways. Tomorrow 20+ friends will join in on the fun and will be posting all of the summer potluck inspiration you may ever need! We’ll be linking you up to so many tasty treats across the web, you might not know what to do with yourself. Or, you might just have to host your own real-life-in-person potluck so that you can cook all of these noms for yourself. Or, cook all the noms just for yourself and call it a “personal potluck”. It’s like a personal pan pizza, but with a lot more food. Wear something stretchy. Before we dive fork face-first into dessert, let’s make sure you’ve had a chance to peek at what else we’ve cooked up this week. Also, go and enter these giveaways. Because, awesome free stuff. You might be thinking to yourself: “What’s better than one dessert? !” We anticipated this thought and have an answer for you: TWO DESSERTS. Ya heard right. Em and I are bringing you separate desserts today, so make sure to head on over to see what she’s cooking up. I don’t want to give it away, but it rhymes with “SHMOWNUTS”. Psst… there’s even a separate giveaway going on over there too. We got fancy. 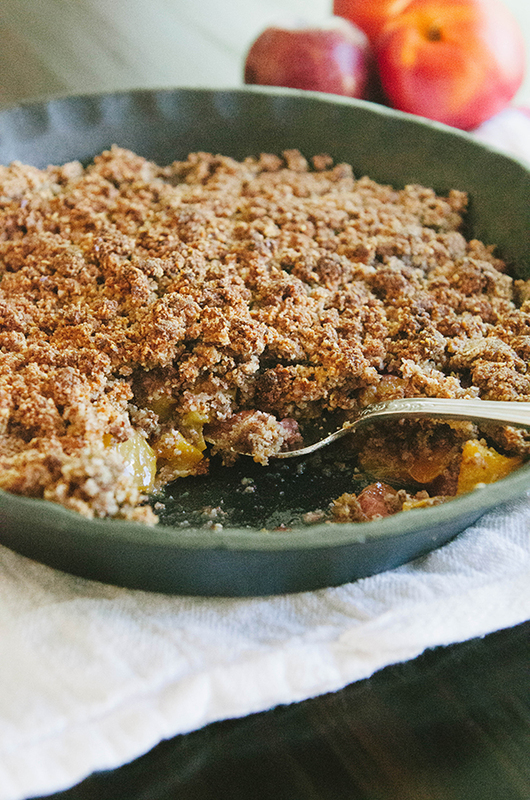 I don’t know about you, but recently I can’t seem to get enough stone fruit into the ol’ pie hole. Since I’m making a cobbler today, should I change that saying to “cobbler hole”? I don’t think it does it any favors. Well, whether it be for pie or for cobbler, this face-hole of mine is going crazy for all things peaches and plums. Nectarines too. And, since I have a tendency to hoard any and all seasonal produce, I found myself with a surplus of stone fruit, ripe and ready for action. 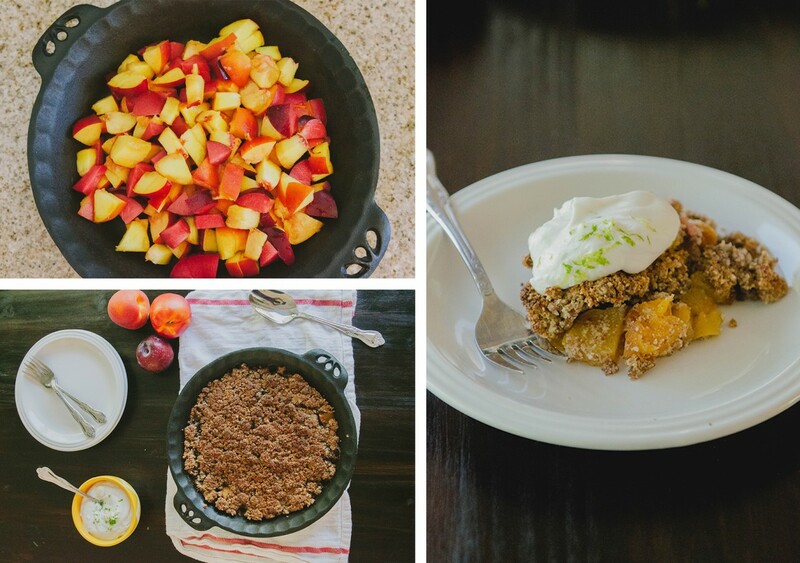 The crumble is grain-free and made out of almond meal. If you haven’t cooked with almond meal before, you should start. It creates the most buttery and wonderfully moist (yeah, I said it) baked goods. I’m seriously addicted. 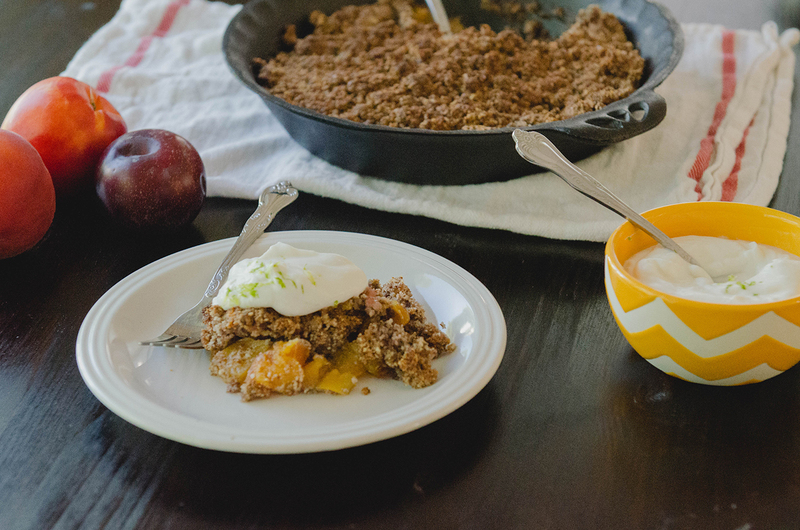 What’s a bunch of hot fruit cobbler without a whipped topping? Well… that would just be a plain hot fruit cobbler. Good, but not great. I like my cobbler with a thick layer of whipped cream on top. To keep things zesty, I decided to whip up (see what I did there?) this LIME coconut whipped cream. It’s tang plays nicely against the buttery crumb and the subtle sweetness of the fruit. Also, it had a really great mouthfeel. I’m not sure exactly what that means, but it felt appropriately ridiculous. 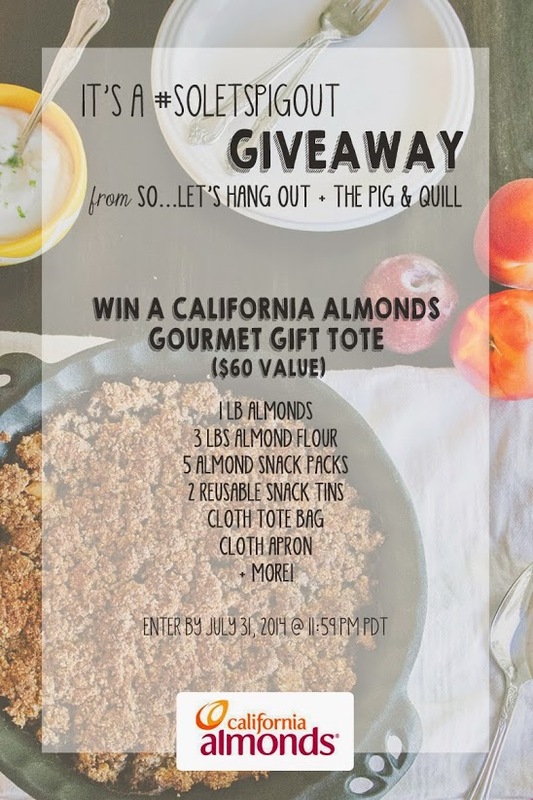 Being as how I’m bonkers for all things almonds–or shall I say NUTS for NUTS, we’re giving away an awesome prize pack from the folks at California Almonds. I told you this week was going to be full of prizes. It’s like Christmas with summer flavors around these parts. Picture it… all the family is gathered around the table. Emily and I are there too, playing the part of those kinda quirky aunts that you never knew you always never wanted. We’re wearing ugly sweaters and drinking too much mulled wine. Or, since it’s summer… maybe we’ll wear matching bedazzled jean shorts and drink too much sangria. Either way, it’s kind of a scene. To put things in perspective, we were stone-cold sober when the picture below was taken. You can choose your friends. You can’t choose your arms. But, you can choose to be your friend’s arms. That’s the saying, right? No? Maybe. Alright. I think it’s time to stop typing now before this goes anymore off the rails! But first, let me hook you up with this great giveaway! Before you dive head first into that Rafflecopter widget, please consider signing up for the So…Let’s Hang Out Weekly Newsletter. I’ll send you updates straight to your inbox and alert you of fun giveaways such as this one! I won’t spam you, but I’ll probably tell you I love you and how to put bourbon into banana bread. 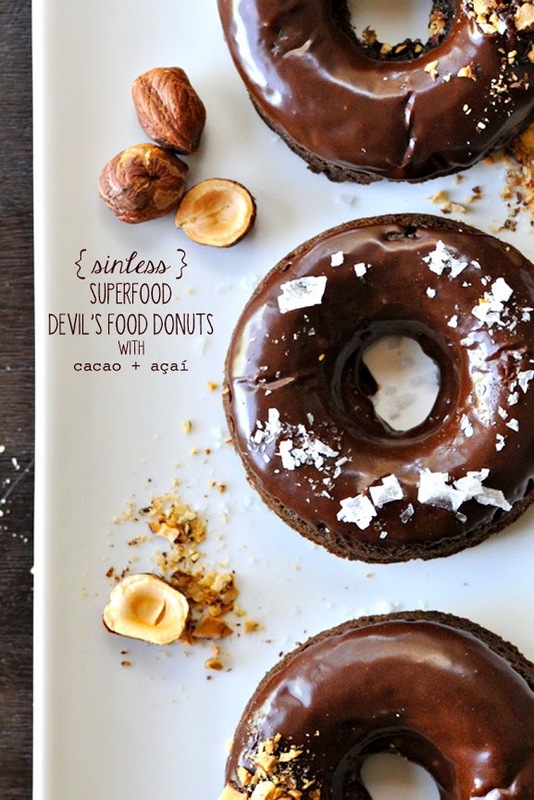 Don’t forget to head on over to The Pig & Quill for MORE DESSERT (see thes donuts?!) and MORE chances to win fun prizes! Wash, pit and slice up all of the stone fruit into manageable bite sized pieces. Add the chopped up fruit to the bottom of an 8 inch pie dish. To make the filling, whisk together the almond meal, salt, nutmeg and cinnamon in a medium sized mixing bowl. In a separate bowl whisk together the coconut oil, maple syrup and vanilla. Pour your wet ingredients into the dry ingredients and mix together with a wooden spoon until crumbly. Using clean hands, crumble the mixture on top of your chopped up fruit. Cover the top of the cobbler with aluminum foil and bake in the oven for 45 minutes. Once 45 minutes have passed, remove the aluminum foil and bake for an additional 5-10 minutes, or until the top is golden brown and you can see the fruit juices getting bubbly. Let the crisp cool on the counter for 15-30 minutes before serving. While you're waiting for the cobbler to cool, start on the lime coconut cream. Open up a can of coconut milk that has been refrigerated over night. The top layer should be thick and cream like. Scoop out that top layer into a bowl (just this layer, not the liquid that has separated form the coconut milk). Add in the lime zest and the lime juice along with the maple syrup. Using a handmixer, beat the ingredients on high until if fluffs up like whipped cream. 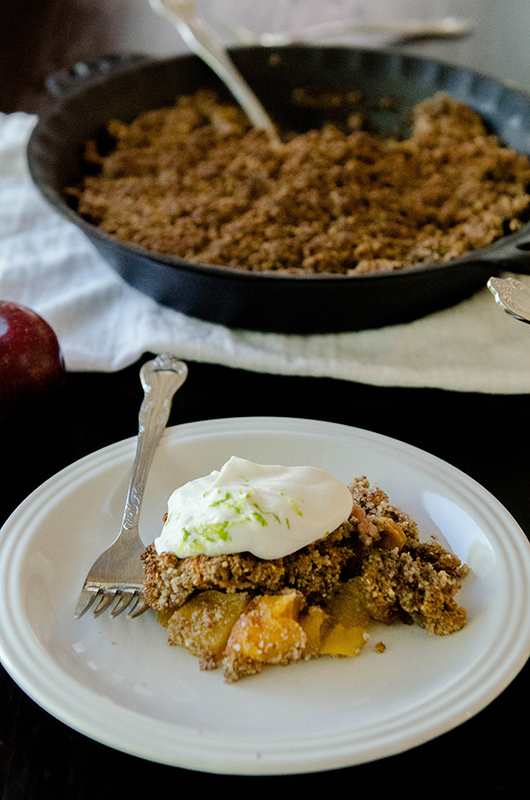 Serve the cobbler topped generously with lime coconut cream. Enjoy! So happy to have this grain-free cobbler recipe up my sleeve. I loooove me some cobbler and it’t that time of year. Thanks for inviting me to this shindig, lady. It was awesome! this looks totally delicious, i can never go past a good cobbler recipe. love that it’s grain free too! definitely a recipe i will be saving.. thanks for sharing! This recipe is total awesomesauce! My husband. & I just had to refrain ourselves from eating the entire dish. I was skeptical about the lime coconut cream (I love me some dairy) but I wouldn’t change a thing about this recipe, so fricken good! Lately all I do is read your blog & laugh out loud…to myself… but I think my husband will ignore the loony behavior if I keep dishing up your recipes …thanks!